In 1936 President Roosevelt visited Dallas to deliver a special address at the Cotton Bowl — part of the Texas Centennial Exposition’s celebration at Fair Park. 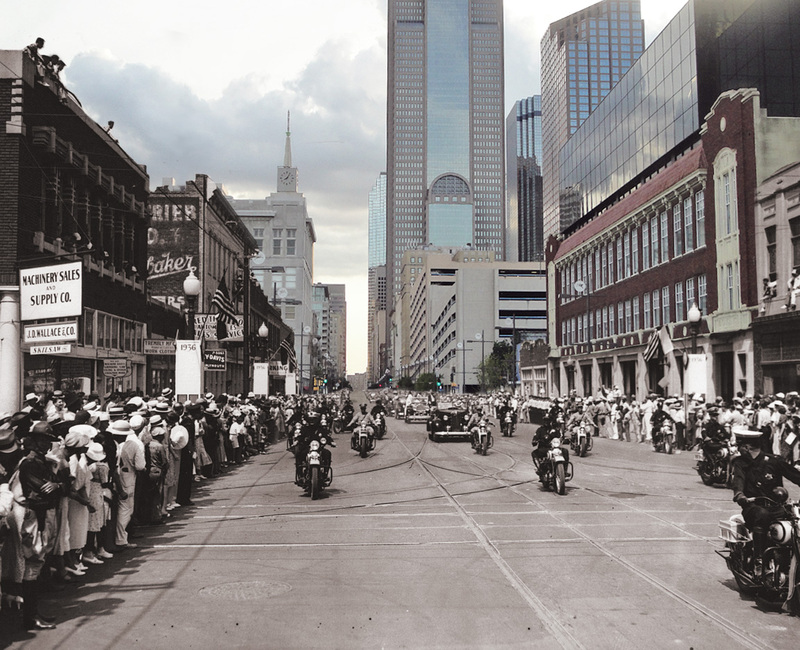 As the President’s motorcade drove east on Main Street towards Deep Ellum enthusiastic crowds watched and waved. Seventy-six years later, a photo from the same location at Main and Cesar Chavez shows what remains and what has been lost as the city has evolved. Today, modern skyscrapers and parking garages fill the horizon, but this block never saw the large development common in other areas of downtown. 2121 Main Street (right in photo) was once home to the Red Motor Company and later served as the Dallas Central Fire Station; the building was nearly demolished years later. The facade was saved, but the addition of a new building above and behind it in the 1980s makes it one of the most unusual “preserved” structures in the neighborhood. Most of the small buildings on the south side of Main Street (left in photo) were demolished for parking lots and have remained vacant for decades — creating a gap in the once-vibrant streetscape (a few of these parking lots still contain tile and brick ghosts as seen here). The streetscape at this intersection will continue to change with the impending expansion of Cesar Chavez, but that’s a story for another day.